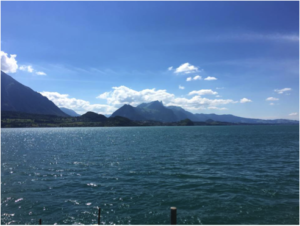 In my last post about visiting Thailand I mentioned that I actually started off that trip with a short stopover in Europe, visiting friends in Interlaken, Switzerland and Madrid, Spain. 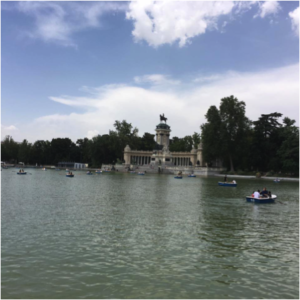 Now I will share with you my experience visiting these 2 very beautiful but vastly different cities, as well as my travel tips that relate to this part of my trip. My trip did not get off to a good start, as you will see in a minute. 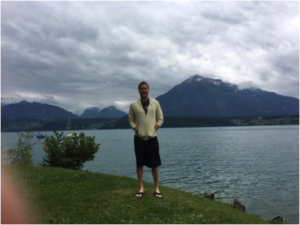 I had booked a direct flight on American Airlines from New York to Zurich, which meant that I had a connecting flight from DC to New York about 4 hours prior to the departure of my flight from New York to Zurich. Theoretically, this should have given me plenty of leeway in case of a delay on my connecting flight. Wishful thinking on my part. Despite perfectly fine weather my connecting flight sat on the tarmac of Reagan National Airport in DC for about 2 hours, and then the flight crew announced that we would be returning to the gate and the flight had been cancelled. As a result, I missed my flight from New York to Zurich and had to rebook with American to a flight from Philly to Zurich the next day, which was the only other flight they could get me on. Needless to say, I will be avoiding American Airlines at all times in the future. The good thing is that I had booked my original flight from New York to Zurich through British Airway’s site using Avios, most of which had also been transferred from my Chase Sapphire card. However, this flight cost me 60,000 Avios, a large amount for an 8-hour flight but it was the best available direct flight I could find. 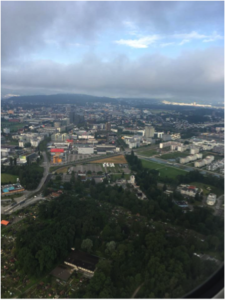 After I finally had everything sorted about and caught my flight from Philly to Zurich the next day, a Saturday, there were no issues on the flight and I arrived in Zurich early on Sunday morning. 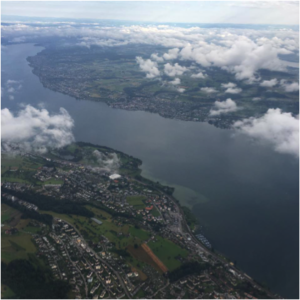 Zurich looked beautiful from the air and I wish I could have spent a day there, but my plan was to hop a train from the airport and head to Bern, which is about a 1-hour train ride from Zurich. Trains in Switzerland are very expensive and there’s really no way around it, so I coughed up about $55 for this ride. A word of advice though, just go straight to the ticket counter. The ticket machines are impossible to figure out if it’s your first time using them. The train ride was smooth and I arrived in Bern on time, where my friend and her boyfriend who live in Interlaken had been kind enough to meet me at the station and drive me the rest of the way to Interlaken, about a 45 min. drive from Bern. 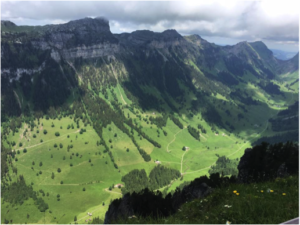 Even though it was cloudy that day, the landscape of this part of Switzerland absolutely blew my mind. Interlaken literally means “between 2 lakes”, and the lake that we drove along on the way to Interlaken was Lake Thun. 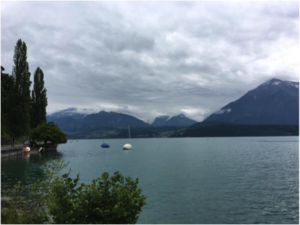 The lake on the other side of Interlaken is called Lake Brienz. 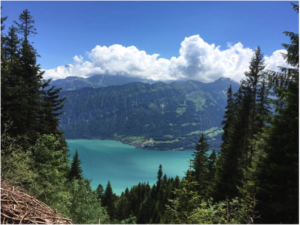 Mountain ranges surround the lakes and Interlaken itself, creating and out-of-this-world backdrop for anyone living, visiting, or just passing through the region. 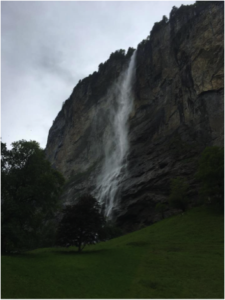 After dropping off my luggage at my friend’s apartment, they decided to take me to Trummelbach Falls for my first Switzerland experience. Trummelbach Falls, I would later find out, are the world’s only accessible glacier waterfalls. They are truly unique but the water flows down the mountain so fast its almost scary. Even more stunning is the valley where the Falls are located. Mountains cover both sides of the valley and a very long waterfall is visible out in the open. By then it was mid-afternoon and I was starting to crash from jetlag, so we made the short drive back to my friend’s apartment and I took a nice nap. 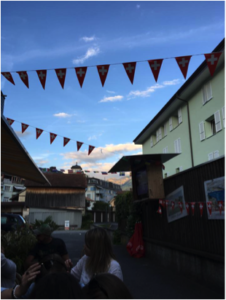 Euro Cup 2016 was going on at the same time as this part of my trip and though I missed the Switzerland game the day before, Germany was playing that evening and the game was being shown on a cool outdoor big screen in Interlaken. We walked over there from my friend’s apartment after my nap and watched the game, which Germany won, while enjoying a few drinks from the makeshift bar that was also set up outside. 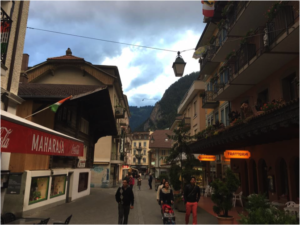 After the game, we walked further into the downtown area of Interlaken to grab a late dinner at a bar/restaurant in the middle of the city. 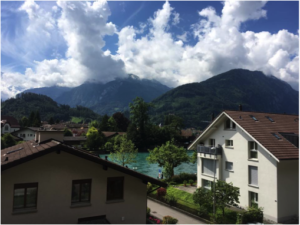 Interlaken, while not a large city by any means, has a very charming downtown area. After calling it a night and getting a good night’s sleep, I awoke the next morning to find the clouds gone and the sun shining. 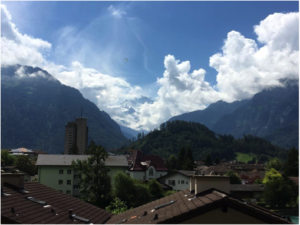 A little luck was on my side as I got to experience a beautiful, clear day before my time in Interlaken ended. Sitting on my friend’s porch and taking in the view, I could not believe that she had such a stunning view from her porch. I snapped a few pictures and spent about 10 min. just taking it in. The next day was a Monday and my friend had taken off work to take me up the mountain right behind where she lived. I can’t remember the name of the mountain, but we took a lift all the way up to the top and whatever mountain it was, the views were incredible. I’m sure if you went up to the top of any mountain in the general vicinity, you would experience the same incredible views. There even happened to be a school at the top of this mountain, which again blew my mind that children got to go to school on top of a mountain. We then decided to rent “standing bikes” as they were called and ride them all the down the mountain. These bikes were actually more like scooters that were made for riding downhill and just had handbrakes to slow them when riding. The trip down the mountain would normally have taken about an hour, but we stopped a few times along the way to take pictures. 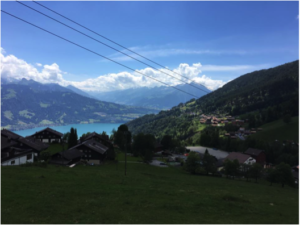 About three quarters of the way down the mountain we rode through a cool little village where people actually lived, overlooking the lake and Interlaken. Here we stopped at a small inn for a drink before finishing our ride down the mountain. 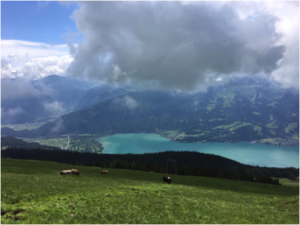 We ended up at a different part of the bottom of the mountain and had to take a bus back to the center of Interlaken, but first we got to take in more views while standing next to the lake. 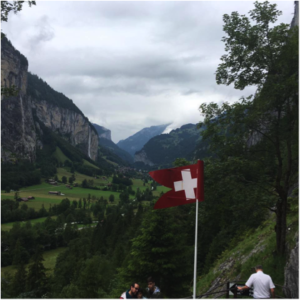 From there, we walked a bit through Interlaken and stopped in a souvenir store so I could buy some things to take back home with me. We then sat outside and ate dinner at a nice little French restaurant. That day’s Euro Cup 2016 games were also starting around that time so after dinner we headed to another bar, this one with outdoor TV’s and a seating area. This is where we spent the remainder of the night until the last game was over. After just 2 days in Interlaken it was time for me to head out to Madrid. This time, I took an early morning train with my friend who was headed to work in Bern. We both got off the train in Bern, where she went to work and I switched trains for the rest of my trip to Zurich. This ride cost me about $75 since I took it all the way from Interlaken to Zurich, about a 2-hour trip. I had booked a flight on Air Europa, a low-cost airline, from Zurich to Madrid. The cost of the trip was about $100 for the 2-hour flight, and pretty solid price in my opinion. Air Europa was not the most comfortable airline I had ever flown, but you can only expect so much from a low-cost airline. 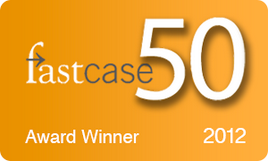 Comparing it to EasyJet which I had flown before, I’d say EasyJet has the slight edge. 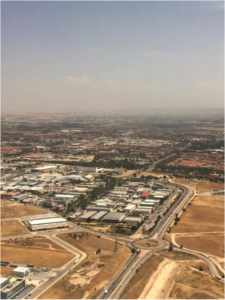 However, the flight was smooth and I arrived in Madrid on time. 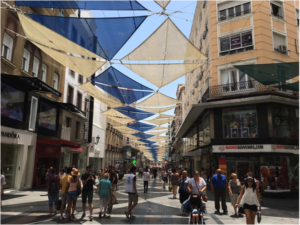 My first impression of Madrid was this: it was hot. Very hot actually. It was quite a change for someone coming from the mountains of Switzerland. But the good thing was there was very little humidity like there is back home in DC, so the heat was actually bearable as long as I drank enough water. Another good thing is there is bus that goes from the airport straight to Atocha station, which is very close to the center of Madrid, for something like 5 euros. There I met up with my friend’s girlfriend who would be accompanying me for the day while my friend who lives there in Madrid was at work. After dropping my luggage off at my friend’s apartment and taking a short break since I had been up since 6:00am, my friend’s girlfriend took me to La Percera del Circulo de Bellas Artes which is a restaurant/bar on the rooftop of a fine arts museum. This seemed to sort of a hidden secret in Madrid by the way she described it to me, and the rooftop did not disappoint. 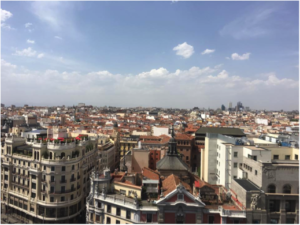 The views of Madrid from this rooftop are amazing, and sangria and other drinks can be had for just a few euros each. There are even comfortable lounging-type seats underneath a tent used to block out the sun, but be warned they are a hot commodity (no pun intended). 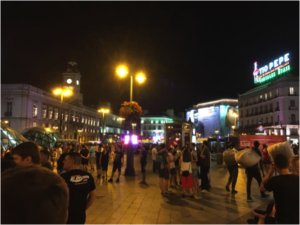 After hanging out at the rooftop for a while, we then headed back toward the area around Puerta del Sol, which is a large public square not in Madrid not too far from my friend’s apartment. Here we stopped by a small bar for a few drinks before heading to a restaurant in the same area. I wish I could remember the names of these places but I cannot track them down. 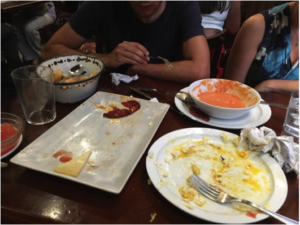 The great thing about bars in Madrid is that most of them will give you something to eat for free if you just order drinks. 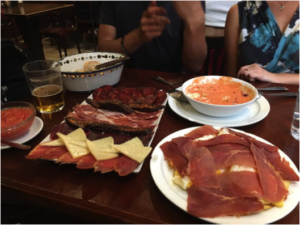 These plates can vary from just a small bowl of nuts or pickled eats to a well-sized play of bread and sliced meat, usually jamon (ham). At the restaurant we pretty much went all out and ordered enough food to feed an entire family for a few days, but of course we finished it all in one sitting (proof below). As could be expected, this was the end of our night as it everyone had had a long day and were now going into massive food comas. Madrid does cool off to a fairly comfortable temperature once the sun goes down, and this made for a nice walk back to my friend’s apartment before passing out. The next morning both my friend and his girlfriend went off to work and I headed out on my own for a free walking tour of Madrid. Whenever I do a free walking tour in Europe, it is always with the Sandeman’s New Europe tour group (http://www.neweuropetours.eu). Overall my experience with this group has been very positive and the only catch is that you should tip your tour guide at the end of the tour if you enjoyed the tour. This is always up to your discretion, but it’s the source of income for the tour guides as the tours themselves are free. 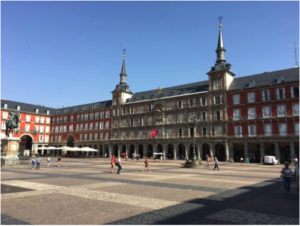 I won’t detail the entirety of the tour here, but the tour started at Plaza Mayor and ended at the Royal Palace, both of which are shown in the pictures below. 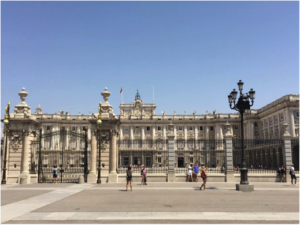 After the tour I had decided to knock off the final place on my list of things to do during my short stay in Madrid, Buen Retiro Park, but somehow first ended up in the main shopping district of Madrid which is in between Gran Via, Plaza Mayor, and Puerta del Sol. The district is partially covered from the sun and has a nice feel to it. Here you can find stores such as Zara, H&M, and endless others. Of course I had to do a bit of shopping now that I had ended up there, and walked away with a small bag or 2 of new clothes. 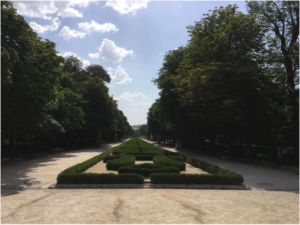 I finally did make it to Buen Retiro Park, which is massive mind you, and walked toward the center of the park. Already tired from walking around in the heat all day, I wasn’t exactly thrilled to discover the actual size of the park. Nonetheless, I did make it to the center and came across the large, beautiful lakes that sits near the center. Many people were out on the lake in little rowboats either rowing around or just drifting and taking in the scene. I quickly decided that I was going to lay down in the grass under the trees along side the lake and take a nap, which was wonderful. After probably 2 hours or so of laying in the park, I found the energy to head back to my friend’s apartment and clean up for dinner. This time for dinner we went to one of my friend’s favorite tapas/wine bars. Again I wish I could remember the name of the place but I can tell you it was along Calle Cava Baja, which is a great area for tapas and bar hopping. 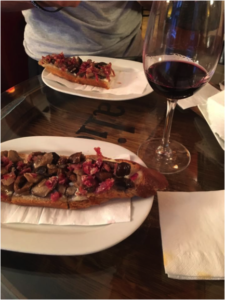 Both the tapas and wine were amazing at the place my friend took me too, though I tried not to stuff myself this time around. After dinner we ended up back at Plaza del Sol and this is where my friend left me as it was a Wednesday night and he still had to work the next day. Plaza del Sol is the meeting point for many of the nighttime pub crawls, so I found a random pub crawl and joined them for the night. I don’t remember nearly every detail of the rest of the night, so you know I had a good time. 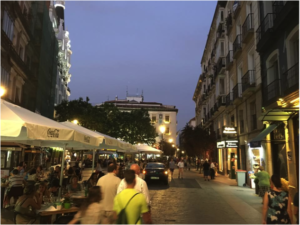 You can easily party in Madrid until 5:00 or 6:00am the next morning, but I at least ended up back at my friend’s apartment around 4:00am, so it could have been worse. The next day I had a late afternoon flight from Madrid to Bangkok (with a stop in Dubai), but I don’t think I moved from my friend’s couch until noon so I didn’t have much time left for sightseeing. I had pretty seen all that I wanted to see at that point though so I decided to just grab breakfast and coffee and wander around a bit looking for souvenirs. After that I grabbed my things and took the subway a few stops back to Atocha station, where I hopped on the same bus that took me back to the airport. I’ve already written about my flight from Madrid to Bangkok in my last post so I’ll skip that part here. 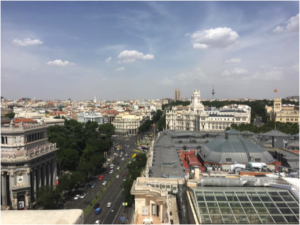 All in all, I think I experienced a lot of what Madrid has to offer, though my friend did keep telling me that I needed to be there about a week or so to really get a feel for the city. He’s probably right, and another trip to Madrid will definitely be in store for me in the future.